Powerful SE blew threw Tofino Wednesday which was great for me as my shoulders were messed up from the previous windless two days of surfing. Epic day in 22g35 SE wind with chest to head high swell. 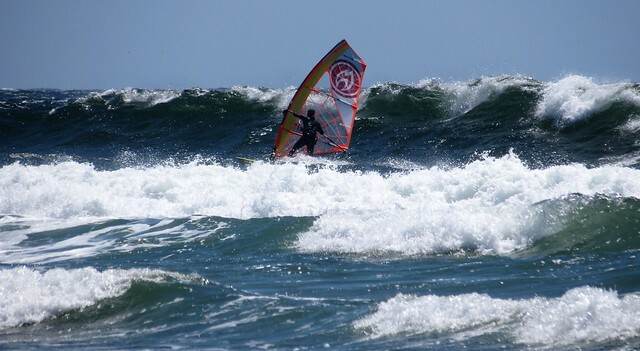 With the wind/wave angle it was hard to surf the waves without trucking downwind pretty fast but I got some nice rides in. Sadly in the video when I'm on chest high waves unless it's curling at my feet you can barely tell I'm on a wave. Gusts were pretty bad at first but manageable. Conditions were pretty intense. Slappy wrote: Sadly in the video when I'm on chest high waves unless it's curling at my feet you can barely tell I'm on a wave. Hey Slappy, nice video. Long Beach looks like a different place on a wet SE! I know what you mean about the way the waves look. It always looks so much smaller on the video and at times you can't see the waves at all when you're riding them. On my last video the waves were head high, some bigger, but they look like nothing in some of those shots. Anyways it looks like you're having fun, it's such a great place to be, enjoy! "It always looks so much smaller on the video and at times you can't see the waves "
Humans like to embellish. A wave can be reported accurately in feet or metres. Head and chest high is numerically vague. I'm 6' but my woman is 5'. I know he's not embellishing at all. I can be riding chest high rollers at the Hatchery and when I check the film it looks like I'm in Squamish. Last edited by adam2 on Thu Jun 07, 2018 10:57 am, edited 1 time in total. While head and chest aren't numerical, they are directly relative to the POV of the video since the camera is in my mouth. I can tell you that those were big waves but watching them on video they only feel big when curling. The unbroken big waves are basically just hills of water and steepness of a hill going down never comes across on camera. Like at 3:10 when I'm chasing down my board and I ride that 5 foot high foam ball it feels like a 5 foot high foam ball. Meanwhile at 8:39 I'm fully riding a 5 foot wave with zero kite power but you can't really tell that from being pulled by the kite across flat water. I like Slappy's reporting -- it's backed up with a video and it's up to me to decide if there's a disconnect in what's he's saying and what he's doing. I guess I am guilty of embellishment when I report it's a 6m day. But my good buddy "God" is smart enough not to get fooled on my reporting. morrison wrote: Humans like to embellish. Ha ha that's for sure! Especially after an awesome windsurfing session. However I'm talking about the go pro effect which definitely makes the waves look smaller. morrison wrote: Head and chest high is numerically vague. I'm 6' but my woman is 5'. So sorry next time I'll be more accurate. I'm 5'9" so the waves were 5'9" and over. The great thing about having Dave there is he takes time to record the conditions on the day. You can definitely see the difference between his shots and my gopro. Looking over 5'9" Photos by DaveC36. This is the same wave, first one's Dave second is from my gopro. 161 meter ride, that's what I thought, head high, yes. And that's just local conditions. Also La Perouse Bank was reading 6-9 feet during that time (2:00 - 4:00).
" We all have our own methods of measuring waves. If it’s a wave that we’ve personally ridden, the calculation is easy: guess the actual size compared to your height, add 6 feet, then subtract 1 foot for each friend who potentially witnessed it from the inside. Using this tried-and-true technique, we can consistently and confidently exaggerate the size of our waves to anyone who will listen later on at the bar. "